The former presiding officer of the Catalan parliament has said a Scottish-style agreed referendum is the solution to the region's political crisis. 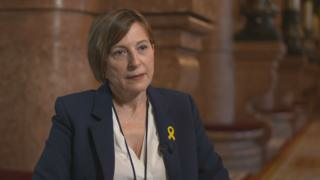 Carme Forcadell was in the chair when the parliament in Barcelona declared Catalonia's independence on 27 October. The declaration followed the disputed referendum in which a majority of those who took part backed independence. Spain does not recognise either the declaration or the result of the referendum which it considered illegal. In a BBC Alba Eòrpa documentary, Ms Forcadell said: "We have always wanted to do it the Scottish way. "This has been impossible because of the Spanish state's refusal to talk. "But for us this is the model to follow, for us there is always hope." Ms Forcadell said: "This is the hope - that we can talk, have a dialogue and find a solution because, if not, things will stay as they are and this will always be a problem, not just for Spain but for Europe." The former presiding officer spent a night in prison for her part in what happened. Four other Catalan leaders remain behind bars. A Spanish judge is expected to rule on Friday whether Ms Forcadell and four others should return to jail. "It's a hard feeling, when they close the doors of the cell," she said. "But I told myself, Carme, it's only one night, it's okay. "I felt profoundly sad for those others who were far from their families and didn't know when it would end. "A feeling of powerlessness and sadness, but for the others." Artur Mas, who was president of Catalonia from 2010 to 2015, blames the current crises on Spain's refusal to negotiate a referendum while he was in office. He said: "I put forward the Scottish and British case as the example many times. "It is what we wanted to do and what we would like to do even now, if it were possible. "But Scotland was able to hold a referendum on independence because Westminster and, above all, Downing Street agreed to it." Mr Mas said: "They sat around a table, spoke about the issue, respected the electoral result, respected democracy and found an agreed solution. "This model, disgracefully, has been impossible for us in Spain." But Enric Millo, the Spanish government's delegate in Catalonia, said the Scottish experience was not relevant to the Catalan situation. He said: "The case of Scotland and the case of Spain are not comparable because they have different constitutions. "We respect, obviously, what other countries can do, but within the Spanish territory, we consider the law has to be applied equally for all. Nobody is above the law."